What do you think the result would be if we were to do a survey asking people the question: “If you were able to bring about the most important and revolutionary event in the entire history of mankind, what would you do?” The majority would probably want to find a cure for AIDS or cancer, or usher in a lasting global peace. Some would probably want to eradicate poverty once and for all. Believe it nor not, these are not the the most important things the post modern and “emergent” thinkers are aiming to do, although they may say so. What they do have in mind is to seek “new” ways and means of entering into the presence of God. Since mankind’s Fall many have tried to take the kingdom of heaven by force (their own efforts), simply because they have rejected God’s way. Don’t be hoodwinked by their manifestos of “wanting to alleviate poverty,” “associating with the poor by living amongst them,” “following in the footsteps of Jesus by exemplifying his example.” These are all stepping stones (own efforts and good works) to bring them into the presence of God. In ancient times it was a very dangerous and a life threatening experience to approach a king without his permission. Even today, in some parts of Africa, you are not allowed to enter a village without the resident chief’s permission. The normal procedure is to first request the chief’s personal assistant to convey your wish to visit him. He would then inform you if and when you may meet with the chief. When an appropriate time is set the envoy meets you at the entrance of the village and accompanies you to the chief’s house in the centre of the village. Don’t even think to knock on his door. That’s bad manners. The envoy enters the chiefs house alone, informs him of your arrival and only then may you enter his home — provided that the chief does not decide to reverse his initial invitation and turn you away at the last moment. Frustrating . . . ? Very frustrating, but that’s the way you need to express your respect and appreciation for the chief as your superior in his village. Not only that; it also proves to the envoy and his chief that you are prepared to humble yourself in their presence. There is a similar narrative in the Old Testament. 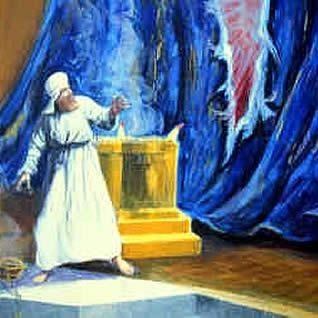 When Mordecai, queen Esther’s uncle disclosed Haman’s plot to destroy all the Jews, he begged her to approach her husband, king Ahasuerus, on his throne and to inform him of the murderous plot. She was at first reluctant because it was too dangerous for her to do so uninvited. Here’s how Esther answered her uncle. The outcome of this event is well-known. When queen Esther approached the king he held out his golden sceptre as a gesture that she may come closer and she touched the top of his sceptre, acknowledging thereby his supreme authority over her as her king and her lord. Had she not done so a multitude of her brethren, the Jews, would have been murdered in a plot which had been orchestrated by Haman. If royal protocol in those days were adhered to so strictly how can we possibly expect the King of kings and the Lord of lords to accept manmade ways to approach Him in His most holy sanctuary in heaven? However, adherents to the Emerging Church are increasingly turning to manmade ways to usher themselves into the presence of God. Indeed, they are forcefully trying to rend the veil from the bottom to the top. In their endeavors to accomplish this the new breed of “Christian” ministers, pastors, apostles, disciples and teachers are demanding a complete change in the way we think about our spirituality, and particularly in the way we experience Christianity. The idea of rethinking our world, leadership and the future is not limited to the secular world but is also increasingly and aggressively advocated in the church. One of the leading proponents of the “possibility thinking” or “positive thinking” cult, Robert Schuller, hosted a “Rethink Conference” in his Crystal Cathedral last year. A conference was scheduled for this year but has been postponed to 2010. Many of the speakers at last year’s conference, amongst them, Erwin McManus, Kay Warren (wife of Rick Warren) and Dan Kimball are proponents of contemplative mysticism and meditation. Fifty e-church members in South Africa, including Stephan Joubert and Dries Lombaard attended the conference in 2008 to rub shoulders with these most distinguished thinkers who are bent on changing the face of Christianity for evermore. They have made a great impact on our younger South African church clergy who in turn are influencing many young people and introducing them to contemplative mysticism. 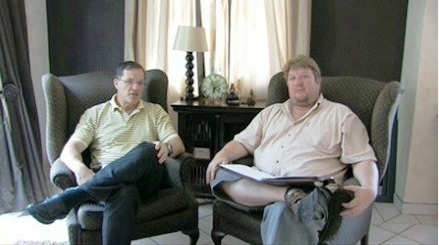 The e-church websites (Afrikaans and English), engineered by Stephan Joubert and Dries Lombaard respectively, are vigorously promoting the contemplative spirituality under the guise of “loving and following Jesus.” In fact, all the followers of Jesus are welcome to comment on their sites and to participate in a relational conversation provided that you are also an avid follower of their gurus, Rob Bell, Leonard Sweet, Nelus Niemandt, Erwin McManus, Doug Pagitt and many other contemplative Christian mystics. Those in agreement with Stephan Joubert and Rob Bell that truth may be found in other religions such as Buddhism, Judaism and even atheism are more than welcome on their websites but you will be summarily ostracized as soon as you sound a warning against their contemplative buddies. In accordance with the “rethinking” culture of the contemplatives, I have decided to rethink, re-imagine, and reconstruct at least one passage from Scripture (Matthew 7: 22-23) to illustrate how they are trying to rend the veil from the bottom to the top. 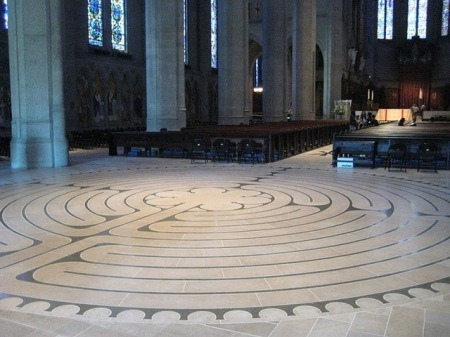 What lies at the heart of contemplative practices such as the labyrinth, silence, breath prayers, solitude, Jesus candles, icons, the Jesus prayer, lectio continua, lectio divina, 12 stages of the cross, which allegedly usher you into the holy presence of God? It all started with Cain’s bloodless sacrifice. Dad Adam and mom Eve taught him, as they did their son Abel, that God’s infinite holiness demanded no other way to approach Him but through the shedding of an innocent victim’s blood. Cain, however, despised God’s slaughtering of an innocent victim to cover up (atone for) their nakedness (sins) and decided to appease and satisfy Him with his own efforts and good works. Since then his way, in biblical terms known as the way of Cain (Jude 1:11), has been perpetuated throughout the ages by men and women who equally despise God’s remedy for our sins. Brian McLaren’s outright denial of the true meaning of the cross is symptomatic of the emergent movement. "Perhaps our ‘inward-turned, individual-salvation-oriented, un-adapted Christianity’ is a colossal and tragic misunderstanding, and perhaps we need to listen again for the true song of salvation, which is ‘good news to all creation.’ So perhaps it’s best to suspend what, if anything, you ‘know’ about what it means to call Jesus ‘Savior’ and to give the matter of salvation some fresh attention. Let’s start simply. In the Bible, save means ‘rescue’ or ‘heal’. It emphatically does not mean ‘save from hell’ or ‘give eternal life after death,’ as many preachers seem to imply in sermon after sermon. Rather its meaning varies from passage to passage, but in general, in any context, save means ‘get out of trouble.’ The trouble could be sickness, war, political intrigue, oppression, poverty, imprisonment, or any kind of danger or evil." (A Generous Orthodoxy, Grand Rapids: Zondervan, 2004, p. 93). The crucifixion to McLaren is nothing more and nothing less than a temporal alleviation of mankind’s suffering caused by sickness, political intrigue, oppression, poverty, imprisonment (regardless of the reasons for a criminal’s incarceration) or any kind of danger or evil. Rob’ Bell’s philosophy of salvation is also related to the temporal in this world and not so much a place (heaven or hell) you go to in the afterlife after you’ve died. His problem is not with Jesus who wants to save all people and restore all things to Himself but with those who affirm that only certain people go to heaven. At his Mars Hill Pastor’s Conference held in January 2007 he asked some pertinent but very dangerous questions — dangerous for those who believe him. Going to heaven? . . . “That’s it?” The best we can do is some other just fire insurance? Just have to save souls? That’s message to the world? That’s despair. . . . Is that the best God can do? I need help today. . . . Is this what Jesus waved in front of people? Some Jesus’ should be rejected. . . . The Jesus who herds people in and kills them should be rejected. Do you believe in a God who would create billions of people only to watch them burn with no chance for any other sort of future? What kind of God do you believe in? Bell’s gospel of hope (in contrast with God’s Gospel of despair), declaring that Jesus wants to save all of us even from the scourge of poverty, is the most unkind, frivolous and destructive bit of exegeses I have ever heard. During his 2007 pastor’s Conference he warned that some Jesus’ ought to be rejected but he has no qualms whatsoever to embrace another Jesus who claims he wants to save the poor from their poverty. His Jesus is definitely not the Jesus who said: “You will always have the poor with you” (John 12:8). There are billions of desperately poor people on the earth. What are they supposed to think of a Jesus who wants to save them from their poverty but fails to do so? I am aware of a “Christ” who has promised to alleviate and even eradicate the plight of the poorest of the poor. His name is Maitreya. All major religions are expecting a divine messenger, albeit under different names, says Creme, and Maitreya has come in fulfillment of the prophecies of each. He has come earlier than anticipated by many religious groups because of the urgency of the times, in order to offer his counsel to a world in crisis. His priorities are simple: food, shelter, health care and education for everyone as guaranteed rights. His advice to humanity is just as simple. Share and save the world. When the plight of the poor and starving millions is alleviated then the recovery of the environment will become the first priority (Benjamin Creme during a press conference on 15 August 2006) (Emphasis added). My task will be to show you how to live together peacefully as brothers. This is simpler than you imagine, My friends, for it requires only the acceptance of sharing. How can you be content with the modes within which you now live: when millions starve and die in squalor; when the rich parade their wealth before the poor; when each man is his neighbor’s enemy; when no man trusts his brother? Allow me to show you the way forward into a simpler life where no man lacks; where no two are alike; where the Joy of Brotherhood manifests through all men. Take your brother’s needs as the measure of your action and solve the problems of the world. (The Christ is Now Here, advertisement in the Rand Daily Mail, 24 April 1982). Is this the Jesus Rob Bell is referring to? It must be because the real Jesus of the Bible is quite capable of saving people from the righteous judgments of God even by utilizing the dire circumstances caused by extreme poverty. In countries like China many people have found salvation in Jesus Christ after they had lost everything — their homes, their wives, their husbands, their savings, etc. They have learnt to be content with what they have despite their extreme poverty (Hebrews 13:5). The preaching of the Gospel in order to save souls from the righteous judgements of God is to Rob Bell a Gospel of despair? Its just a fire insurance? No! says Rob Bell, the message of the Gospel is that God would never have created billions of people only to have them burn in hell with no chance for any other sort of future. His inference that people come to Jesus in all sorts of ways for their salvation opens the door wide for people of all religious persuasions to indulge in contemplative mysticism. 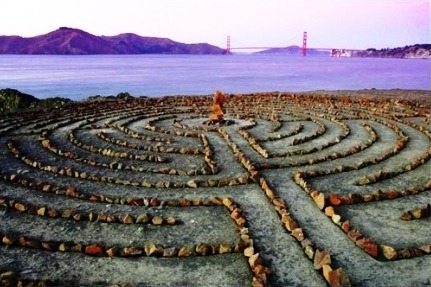 It is therefore no wonder that such a low estimate of Christ’s sacrifice has lead to the notion that labyrinths and other contemplative practices are mystically empowered to bring anyone, regardless of their opinion of the cross, into the presence of God. In a downloadable PDF document of Bell’s Mars Hill church the sixth phase of the mystic practice of “lectio divina” the following advice is given. Finish by focusing your attention on the fact that God’s presence is with you. If as you try to focus on God’s presence you sense a need to read the text again, to continue meditating, or to simply continue talking with God, allow yourself to do so. As you do, know that you are in the presence of God. (Emphasis added). Recently, I was privileged enough to get my hands (and eyes!) on Everything is Spiritual by Rob Bell. You ask "Why Rob Bell again? Didn’t you review his material last time?" Well, I’m learning quite a bit from this most-genial disciple of Jesus and I want to share my excitement. My next post will be on someone different… Promise. “The most-genial disciple of Jesus?” Really? The one who unashamedly distorts the Gospel of salvation? The one who promotes a kind of universalistic redemption? Have we grown so accustomed to our wilful apostasy that we wilfully refuse to discern the spirit of antichrist in those whom we regard as followers of Jesus? In my introduction I mentioned Esther who was afraid to approach her husband, king Ahasuerus, because she feared that he may not extend his sceptre of authority and approval to her. Although we are admonished to fear God, for it is a fearful thing to fall into the hands of the living God (Hebrews 10:31), all believers who have been cleansed of their sins in the blood of Christ have the confidence and boldness to enter into his presence in the most holy of holies in heaven. They may do so anytime and anywhere for the rest of their lives here on earth until they meet with Jesus face to face. What more do we want? What more do we need? Those who believe they may enter into the presence of God by means of their dusty and filthy labyrinths in the bushveld or even on the dusty marble floors of lofty cathedrals and other mystical contemplative paraphernalia are deceived and are deceiving others, especially our youth. They are not following Jesus Christ, the Son of the living God, but another Jesus. Stop your nonsense and return to the cross of Jesus Christ. The blood of His cross is God’s sceptre He extends to everyone who is willing to touch the cross in faith for their salvation so that they may enter into His presence with rejoicing and eternal thanksgiving.